PVA enables veterans with spinal cord injury and disease to live beyond their injury. 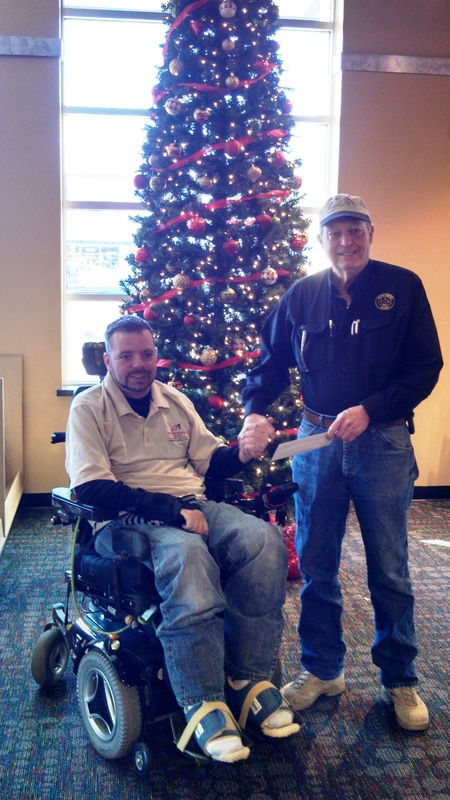 CSA raised money during the month of November for the PVA’s Mid-Atlantic Chapter’s Shooting Program. Enabling veterans with spinal cord injury and disease to live beyond their injury. With us, these veterans can face any task in front of them without fear, because of the encouragement and support that our organization provides. Located in Chesterfield County, Virginia, the Paralyzed Veterans of America, Mid-Atlantic Chapter was officially formed in 1947 and is one of the six original co-founding chapters of the organization. With nearly a thousand members, the work continues today to create an America where all veterans and people with disabilities, and their families, have everything they need to live full and productive lives. Sports, Recreation and Rehab is our biggest program not just for funding but also because Sports and Recreation are the key to many of our members leading healthy, productive lives. Our shooting programs are our biggest programs within Sports, Recreation and Rehab. We host 3 trap shoots a year, 1 air gun tournament and we participate in 4 hunts. Our November trap shoot is part of our National organizations Trap shoot circuit. Many of our members who are serious about competition use it for practice for larger competitions including the Paralympic programs. We also host an Air Gun tournament which is part of our National Circuit. Last year we had 22 paralyzed veterans participate in this event at CSA. Finally, we send several wheelchair hunters to 4 different hunts each year. Trap shoot and Air Gun are also part of our National Veterans Wheelchair Games. Last year we sent 51 athletes to the Games and we had about 10 of them compete in both trap shoot and air gun. The most important reason for us to have these programs is for our newly injured members. The shooting programs offer a lot of camaraderie. The members who are veterans encourage the newly injured to participate in these programs because it is something they are familiar with but it is also a good outing for newer injuries to start their transition process. Adaptive sports programs are known to be the key to more successful transitions for our newer injuries. The need for funding comes in because those injuries that are non-service connected cannot generally afford entry fees, ammunition and even sometimes guns for the events. What we do is supply funding for entry fees, supply ammunition and we have guns at our Veterans Hospital that the members can use if they cannot afford one on their own or sometimes we may give away prizes that help with costs. We are seeing an increase in new injuries not just from conflicts but also because of our aging population of veterans. Our membership has increased steadily over the last two years. We currently have 948 members and many of them participate in shooting programs. The economy has gotten harder for the non-service connected veterans and many of them have cut out the recreation programs because of cost. The issue is without these programs to encourage a positive transitions and a healthy lifestyle, many of our veterans become, isolated, depressed and a lot less productive. Veterans who have been injured still want to be able to do the things they did before they were injured. Shooting competitions and hunts allow them to be able to do this. There are so many reasons to continue to help us support our shooting programs but the main one is that they continue to build strong bonds and support systems for our members not just with each other but with organizations and companies that see the need to support this community.